Volcano Art Center is proud to announce the exhibition Ho’okuʻi i nā Kiko (Connecting the Dots). Presented by Hale Nauā III, Society of Maoli Arts, the exhibit displays the multi-media artworks of Natalie Mahina Jensen and Lucia Tarallo. The exhibit will be on display 9am -5pm daily at the Volcano Art Center Gallery in Hawaiʻi Volcanoes National Park from March 31st – May 6th, 2018. The public is invited to a free lecture provided by Lucia Tarallo beginning at 3pm on March 31st, with an opening reception to follow. While these events are free, National Park entrance fees apply. Born in Honolulu, and raised in Makaha on the island of O`ahu Natalie Mahina Jensen was educated and trained since childhood in Nā Mea Hulu, Native Hawaiian feather work, later specializing in the Sculpted Feathered Staff called Kāhili Ku. Her first art exhibit was at age eleven with Hale Nauā III, Society of Maoli Arts, a collective founded by her artist father, National Treasure Rocky Ka`iouliokahihikolo`Ehu Jensen in 1976. 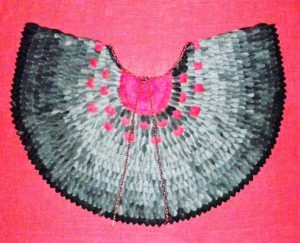 By her eighteenth birthday she had been commissioned by the corporate, public and private sectors – a collection of feathered capes and Kāhili that grace more than a dozen public sites in the islands and abroad. For many years her feathered sculpture was given by the Hawai`i Visitor’s Bureau as their ultimate award for excellence. She continues to teach feather work in workshops all over the state of Hawai`i and the U.S. continent. Research historian, lecturer, award-winning author, and artist, Lucia Tarallo has designed, mounted and curated more than 150 fine art exhibitions locally, nationally and internationally. Together with her daughter, Natalie Mahina, she wrote the award-winning Daughters of Haumea, honored with the Po`okela Award of Excellence. For years, she has written an art column for Ka Wai Ola, the newspaper for the Office of Hawaiian Affairs, also for Nā `Ōiwi. Her writings on Maoli culture are also included in countless magazines, newspapers and academic art journals. Aside from her feather work, writings and curated fine art exhibitions which are displayed in collections throughout the world, Lucia Tarallo has taught Hawaiian art history at the Bishop Museum, Edith Kanaka`ole Foundation, Nā Pua No`eau, Liliu`okalani Trust, Kamehameha Schools, Hawai`i Community College, and most recently at Ke Ana La`ahana Public Charter School.